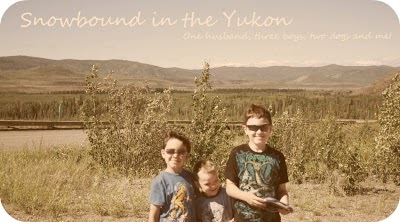 Snowbound in the Yukon: Okay, I have a confession to make. I read The Twilight Saga and I love it! I'd only just heard of it late last year. I knew there was a movie coming out and a friend of mine recommended them to me. So I eventually ordered the first two books. I do read a lot and thought I would get around to them at some point. So near the end of January I wasn't sure what I was in the mood for. I couldn't get into anything, I decided I wanted to read some fluff, something easy and not too in depth. I'm not usually one for romance novels. So I started it and I read it over a course of a week, a few pages here and there and then it caught me and I couldn't put it down. I quickly read the next and the next day I went down to the bookstore and was lucky enough that they had the last two. Unfortunately I slipped that evening and hurt my back. I was at home laid up for two days and each day I read one of the books. It's been awhile since I've done anything of a sort. Sad, to say I have to hurt my back and not be able to move around very well to get a days rest from my family. Hubby did well by me and took care of everything. So here I was finished the books and not sure what else to read. I tried for weeks, picking up and discarding books to the pile of books on my night stand. I couldn't get into anything, I was quite taken aback. I kept thinking about the character in the Twilight Saga. I felt ashamed that a adult woman of my age would be so smitten with a book written for young adults. I'd read other young adult novels without this kind of feeling. What did I do? I picked up the books again and reread them. I was still having this problem not to long ago and started them again for a third time. This time I only got through the second book and I think I'm finally getting over this little obsession of mine. Only I think in part to the fact that I've been reading the websites online, the author's website with the first 12 chapters written from Edward's point of view and all her deleted scenes. Then I moved onto The Twilight Saga website and found others my age and older obsessing over the book. I discovered Fan Fiction, I'd never read any Fan Fiction before on other topics and was intrigued. Some of it is quite good. I think the thing that loosened the grips of this infatuation was reading the boards, the details and the scrutinizing of Ms. Meyer's writing and characters. I read for the love of reading, for getting lost in the characters and story line. I loved the Twilight books because of the characters, the intimate details of them and love story that evolved. Sure I was frustrated with New Moon and even more so with Eclipse but Breaking Dawn was just the right ending to the series. But I hate seeing the characters changed in the Fan Fiction, I had the indepth dissections of the Sage, they are just disheartening. I don't want to look at the flas I just want to enjoy the bliss that is Edward. Also I think that fact that I admitted and gave evidence of my, for lack of a better word obsession of these books and characters on another blog helped me see what trouble I'd brought on myself by being so involved. I haven't even seen the movie yet but I did order it, it'll be here in another week and even though I heard the movie was bad, I still love drippy teenage romance movies. I've never read a book over and over again like this, usually I'll have a year's break or something but this just kept me coming back for more. I think maybe now I can move on to other books for awhile. I've started two different books altogether and I'm hoping that with be the end of that for awhile. A good thing did come out of the books, I've started writing again. One thing about Ms. Meyer's writing is that I found it similar to mine. While not sophisticated and I don't feel like I use the thesaurus like she can, it reminded me of my attention to detail and focus on characters and not so much plot line. I got me going over some past work and refining and tweaking it. Though, I'm trying to fill in the blanks and add more plot than just character buildup and descriptions, I'm very good at descriptions. Another good thing is that at least I know I'm not the only one out there who feels this way. Don't worry, you are not alone in your obsession! That's exactly how I felt and feel. I honestly could think of nothing else while reading the saga and for awhile afterwards. I re-read Twilight and I will very soon re-read New Moon. I watched the film again in Vancouver in this cool old theatre. It was better without the stupid Whitehorse experience. There are still major problems in my opinion but I know a lot of people who loved it. I can't wait to see what you will think of it!